This week our design team was given a challenge by our wonderful and extremely talented team leader, Vicki Chrisman. 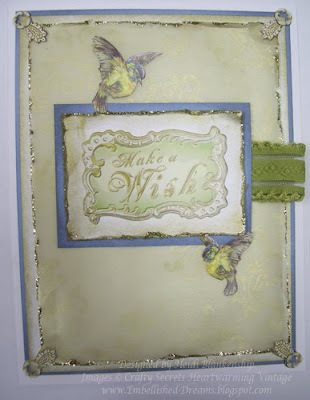 Our challenge was to create a card or project using the Artsy Alphabet stamp set from Crafty Secrets. Here is a close up of a couple of the letters from my project. Look at all the detail! I love all the tiny little flourishes in each letter, it makes creating with this letter set so much fun. 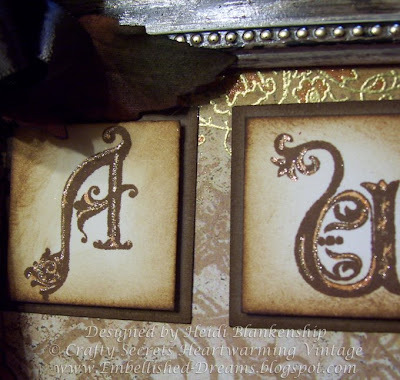 Here is the project I created using the Artsy Alphabet stamp set. You can click on all of the pictures to see a larger picture with all of the detail. I love the beautiful earth tone colors of fall. To me the colors of fall are so rich and creamy and comforting. 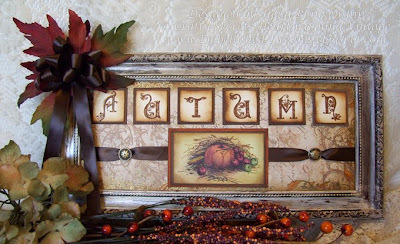 I used ivory, browns, gold and golden orange with a little touch of green to create this beautiful Autumn frame. Each letter was stamped on Cryogen White CS using Ranger Distress Ink, Vintage Photo , sponged around the edges and then I added some sparkles to the tiny flourishes in each letter using the Spica Orange Glitter Pen from Copic. The letters were punched out and then I added a popdot and a larger brown square punch out to the back of the letter for a mat. 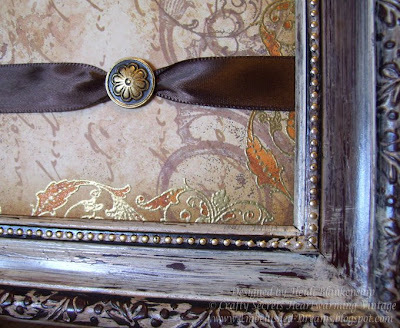 The frame is 14 1/4 x 7 1/4 and the designer paper pads from Crafty Secrets work wonderfully for this size of frame. I only had to cut off just a little of the designer paper for the perfect fit. The designer paper is from the Earthy Paper Design Pad. This piece already had some script writing and flourishes on it. I wanted to add some more detail to the paper so I stamped the edges with one of the flourishes from the Flourish stamp set using a gold ink and then embossed in gold. I filled in some of the detail in the flourishes with the Spica Orange Glitter Pen from Copic. 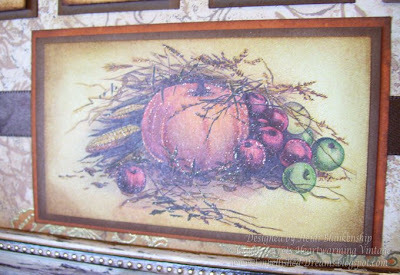 The beautiful picture of the pumpkin with the apples, corn and wheat is from one of the Seasonal Heartwarming Vintage Booklets, Celebrating Seasons & Holidays. I also added a little sparkle to the fall picture using the Spica Glitter pens. I used the Gold, Organge, Melon and Red glitter pens. I also wanted to share with you a few before and after pictures. Here is the frame before. Now here is the frame after I did a little bit of painting and altering. 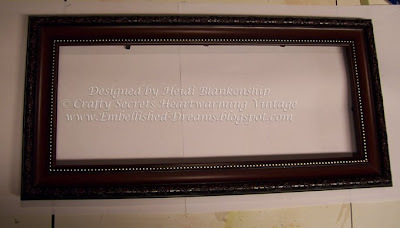 I used Coffee Bean paint to paint over the entire frame and once that was dry then I painted over that using Daisy Cream paint. 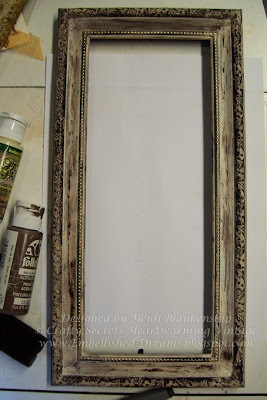 When I used the Daisy Cream paint I went over one section of the frame at a time and then used a rag to wipe off some of the paint before it was dry. Once the paint was completly dry I used sealer with a satin finish. 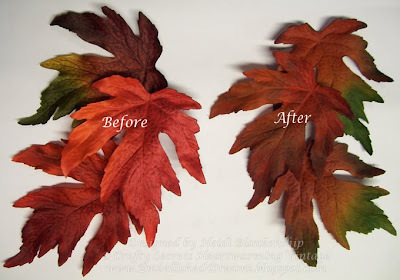 Here is a picture showing the before and after results of the fall leaves. It's amazing what you can do with a little ink! The leaves were a little too bright for my project and I wanted to tone them down a bit. I used three different colors of the Ranger Adirondack Inks, Terra Cotta, Butterscotch & Bottle to get the color I wanted for the leaves. Here is another view of the frame so you can see some of the dimension. Also don't forget to check out the blogs for all of the other ladies on the Crafty Secrets Design Team, I know they will have wonderful projects to inspire all of you!! Here are the links for all of the Ladies on the Crafty Secrets Design Team. Don't forget to stop by each of them and leave a little love! Also you can click HERE to check out the Crafty Secrets Blog. I hope you have enjoyed my project using the Artsy Alphabet! Thanks so much for stopping by today and I hope you have a wonderful week!! 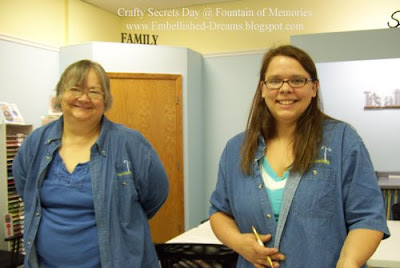 This past Saturday I was at Fountain of Memories for a Special Crafty Secrets Day. I was there in the afternoon doing demos and make-n-takes and I had such a blast with all of those ladies!! Some of the ladies were long time stampers and some of them have just found a new hobby and are very excited about Crafty Secrets products and learning all about stamping. This is Nancy who is the store owner and her daughter Dayna who also works at Fountain of Memories and takes care of all the ordering. Dayna also has a blog & you can see some of her design work HERE. Some of the ladies doing one of the make-n-takes. Here's one of the make-n-takes the ladies were able to do. Since Fountain of Memories has Srappers and Stampers I wanted to have projects for each of them. The first one is a card and the second one is a tag that could be used as a scrapbook element with a smaller hidden tag on the inside for journaling. 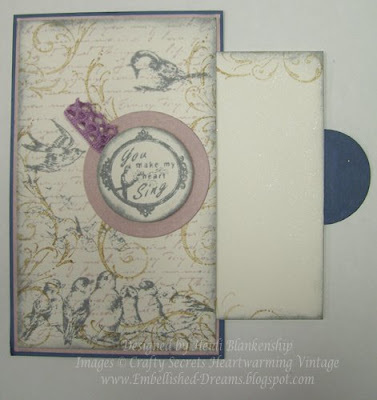 Both the card and the tag were done using three of the Crafty Secrets stamp sets: Journaling (the script writing), Cherubs (flourish) and Bird Notes (birds). This cute little kitchen towel was part of the demo. I showed the ladies how fun, quick and easy it is to work with the Cotton Scraps from Crafty Secrets. 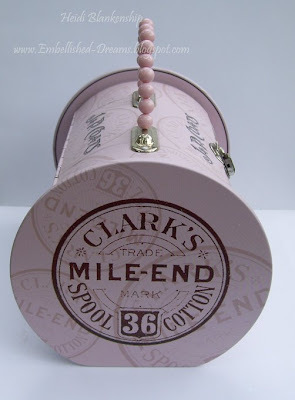 Cotton Scraps are images printed on cotton twill. They have a paper backing but no glue or adhesive so you can either sew them onto something or you can glue them on. You can also use tape runners, buttons and brads to hold them in place. 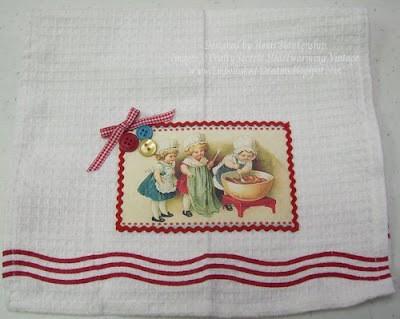 The towel was done using one of the images from the Cooking Cotton Scraps. 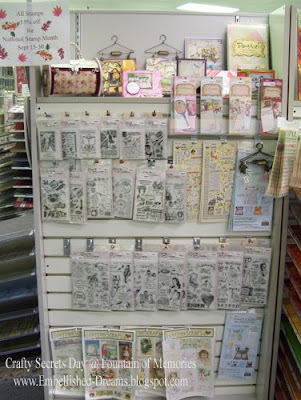 Here is the display at Fountain of Memories with all of the Wonderful Crafty Secrets products they are carrying in their store. This is another card that I did during the demo. It is kind of hard to see in the picture, but the light green velum has flourishes stamped on it in gold. I used a gold pigment ink and then instead of heatsetting the pigment ink I lightly buffed it (using a kleenex), doing this tones down the gold and leave a very soft (kind of dreamy looking) image. The flourish is from the Mini Memories stamp set. 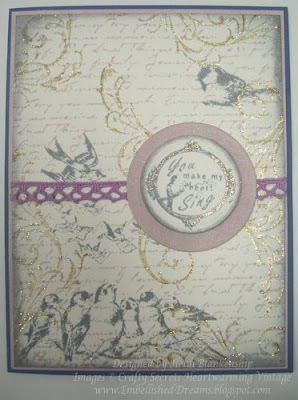 The sentiment, birds and the corner elements are all stickers from Greetings and Sentiments sticker sheet. Here is the second make-n-take that the ladies could make. The first one is a card and the second one is a matchbook. The matchbook open and there is a tri-fold on the inside with room for pictures and journaling. 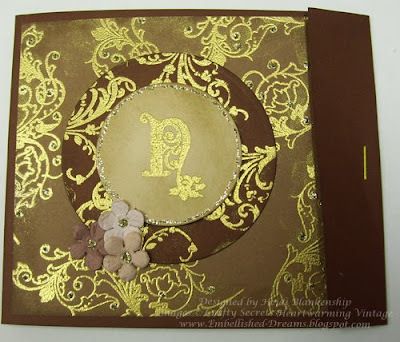 Both the card and the matchbook were done using the Flourishes stamp set and the Artsy Alphabet stamp set for the monogram. On the inside of the matchbook I also used Frame It stamp set to add lines for the journaling. This next project was also a demo and I was showing the ladies how you can have a few little items and make up a quick little gift. I also did a demo using the Copic markers on the tea bag. The tea bag is from the Coffee & Tea stamp set. 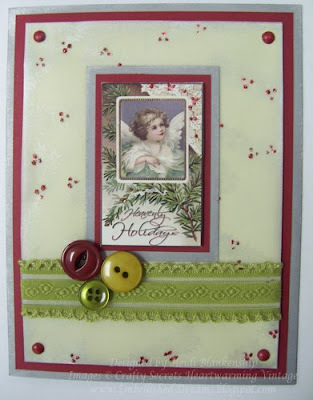 The Christmas card was also a demo using the Vintage cuts. The image is from the Christmas Time Vintage Cuts. 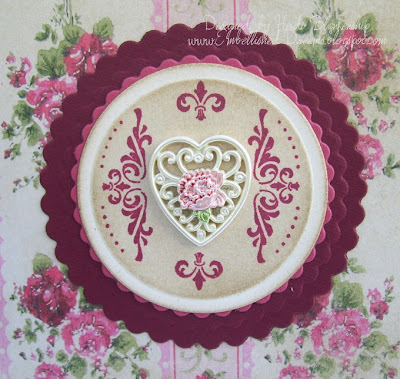 The Vintage Cuts are so beautifully done and they work great to make quick and easy focal point for cards and so many other projects. A couple more of the ladies looking at all of the wonderful Crafty Secrets products & trying to decide what to order! Here is another project from the demo. 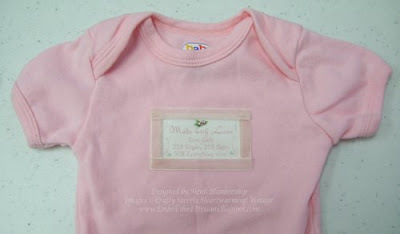 Using the Cotton Scraps, Baby Girl and a little bit of pink velvet ribbon I made this cute little onesie. 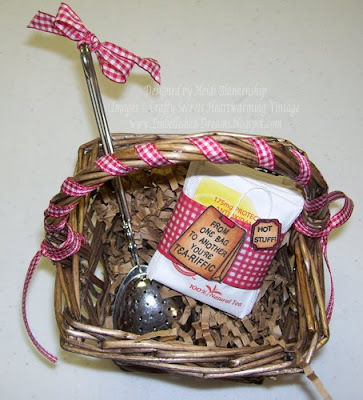 These are so quick and easy to make and they would make a perfect little gift. I hope you enjoyed all of the picture and different designs! I have a ton more pictures but I'm saving some of them for another post. 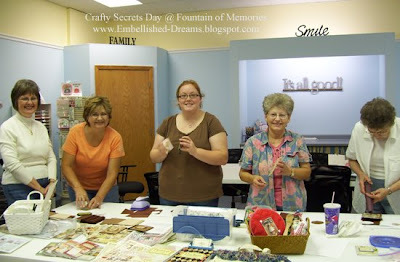 I also wanted to mention for all of the local people I will be back at Fountain of Memories on Oct. 4th from 12-3 pm teaching a class using Crafty Secrets products. The class will be a Halloween theme and we will be using the NEW Crafty Secrets Halloween Fun Stamp Set. If you are interested stop by Fountain of Memories to sign up or give them a call @ 507-373-1996. JustRite Stampers has started something new and fun for Fridays called Inspiration Friday and I am so excited to announce that I was invited to be JustRite Stampers first "Inspiration Friday" Guest Designer!! I love using the JustRite products, they are easy and fun to use and because you can design your own stamps the possibilities are endless!! Your imagination is your only limitation! I am so honored to be chosen for Inspiration Friday!! Thank you so much to JustRite Stampers!!! 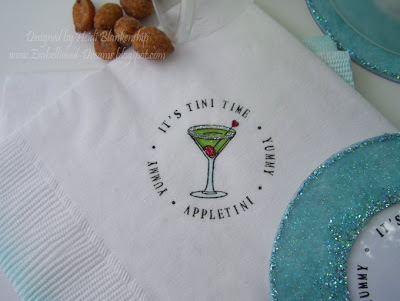 The Inspiration project featured on the JustRite Stampers Blog is the "Appletini Ensemble" that I desinged for the Stampin' Champion Contest. Thank you so much for stopping by today and I hope you have a Fantastic Weekend!! **Just a friendly reminder for all of the local readers I will be at Fountain of Memories today from 12-3 doing demonstrations and make-n-takes. Hope to see you there! Before I tell you about today's card I want to say Thank You very much for all of the wonderful comments and personal emails about the Appletini ensemble!! I love hearing from you and reading all the comments & emails!! Today's card is a baby girl card that I made awhile back for my mom to give to one of her co-workers. 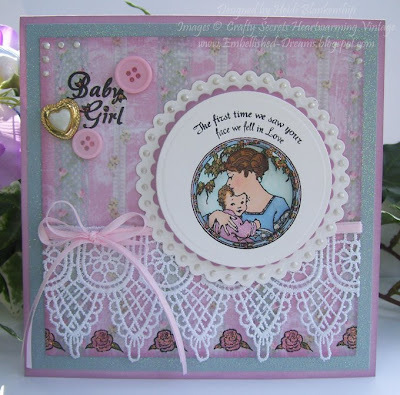 I used the Baby Girl stamp set and Pastel Paper Designs from Crafty Secrets. I cut and embossed two circle die cuts using the Wizard and Classic Circle Nestabilities from Spellbinders and Cryogen White CS. I stamped the image twice and colored them using Copic markers. On one image I only colored in the outer circle and leaves and then cut out the center of the image using a craft knife. I added the sentiment and then layered the two pieces using pop dots. Then I cut and embossed two Petite Scallop Circle Nestabilities from Spellbinders to use for a mat and added some Liquid Pearls from Ranger to the scalloped edge. 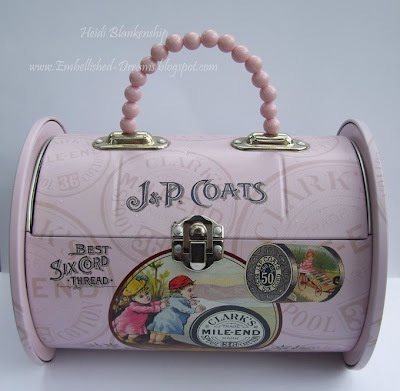 I used Fabri-Tac adhesive from Beacon to apply the lace trim and then added the pink ribbon. After adding the lace trim I stamped a rose in between the scallops on the lace and colored with Copic markers. 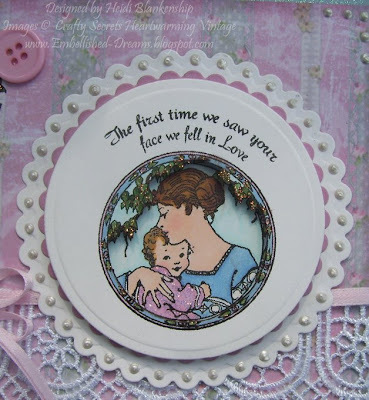 I assembled the card as shown and then stamped the baby girl sentiment and added more liquid pearls in the corners, a few buttons and a little bit of stickles for some sparkle. Here is a close up of the mother and baby girl. 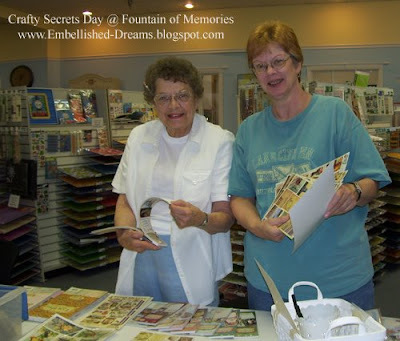 For all of you local blog readers I wanted to let you know I will be at Fountain of Memories in the Skyline Plaza this coming Saturday, September 20th from 12:00 - 3:00 doing demonstrations and make-n-takes for a Special Crafty Secrets Event Day at Fountain of Memories. So if you are in the area please stop by & say Hello! I would love to see you!! Thank you so much for stopping by today and I hope you are off to a great week!! Oh, one more thing--I haven't forgotten about the tutorial for the monogram purse, a couple of other things came up so I had to bump it to a little later this week so be sure to stop back!! Have a Wonderful Day!! As some of you know over the past couple weeks JustRite Stampers has been having a JustRite Stampin' Champion Contest going on over on their blog. I was lucky enough to have a few of my cards chosen as "hopefuls" and I was also in the weekly vote. Over the weekend we were all asked to make a card & a non-card project even though at that point we didn't know who the top three were going to be. They wanted all of us to be able to have enough time to work on projects if we ended up in the finals. Well last night the voting results were in. I didn't happen to make it into the finals BUT I had a ton of fun creating my non-card project!! Be sure to check out the JustRite Stampers Blog to see all of the amazing design work from the top nine ladies in the finals!! Those girls have been BUSY!! You can also vote on your favorite project. While you are there scroll down a little further and read all about the sponsors & the AMAZING prize packages!!! Before I show you my non-card project I want to show you the card I made for the contest. I used the Small Letters set from JustRite Stampers for the sentiment. I just love the colors on this card! The CS is from WorldWin, Nestabilities are from Spellbinders and the stamped images are from Crafty Secrets, Frame It & Flourishes stamp sets. I used Adirondack Pitch Black ink and Frayed Burlap Distress ink both from Ranger. I also used a brilliant gold EP, added a button to the center of the nestability and some gold ribbon. Ok now onto the FUN PROJECT! 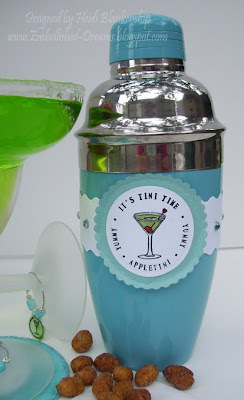 For my non-card project I made a fun little Appletini ensemble. I made charms for the glasses, coasters, decorative napkins and I also altered the shaker. Here are some closeups of each piece. The Shaker~ To alter the shaker I used the Small Letter set from JustRite Stampers for the sentiment. 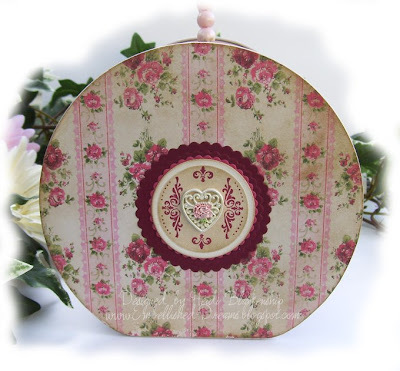 I made the belly band using one of the NEW Pierceabilities dies, Ric Rac Scallop from Spellbinders and I also used the Classic & Scallop Circle Nestabilites from Spellbinders. The stamped image is from the NEW Crafty Secrets, Glamour Girls stamp set. 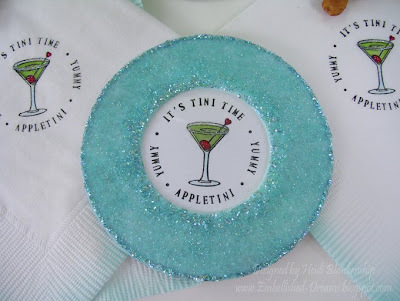 On the little martini glass, I colored it using Copic markers, and then I added a little "sugar" to the rim using Beacon Zip Dry adhesive and Sparkling Snow glitter from Sparkle N Sprinkle. Then I added some red stickle to change the olive into a cherry. Once the stickles was dry then I added some clear dimensional glaze to the drink. For a little bit of bling I added some rhinestones on the band & colored them with Copic markers to match. All of the CS is from WorldWin. The Charms~ The charms were really easy to make! For the charms I used shrink plastic that I cut using the Wizard and the Classic Circle Nestablities from Spellbinders. For the border I used one of the borders from the C-45 Monogram set from JustRite Stampers and the martini is from the Crafty Secrets Glamour Girls set. I stamped the images using Adirondack Pitch Black pigment ink. Then I airbrushed them using Copic markers & the ABS. Once I had the charms done I made the rings and added some beads. Here is a little tip for making the rings--make a little loop on one end of your wire piece and then wrap it around a stickles bottle it makes the perfect size ring! And the Napkins~ For the napkins I used the Small Letter Set from JustRite Stampers & the martini glass is from Crafty Secrets NEW Glamour Girl stamp set. 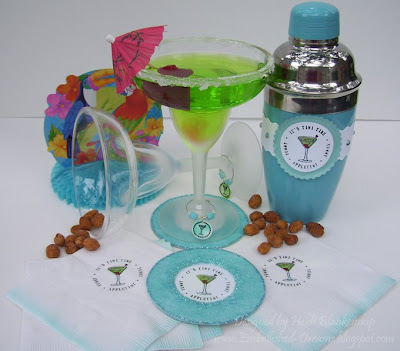 I used Copic markers to color in the martini and add a little "sugar" glitter to the rim. Thanks so much for stopping by today!! I hope you enjoyed the little Appletini ensemble! The best part was after the pictures were taken I got to enjoy the yummy Appletini! LOL!! 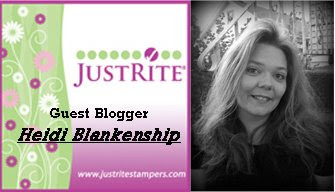 Don't forget to hop on over the the JustRite Stampers Blog & vote for your favorite!! I hope you have a Fantastic Day!! All I can say is WOW my inbox has been flooded with questions about the Monogram Purse!!! I will tell you all about it but first I have something else I want to share with you. 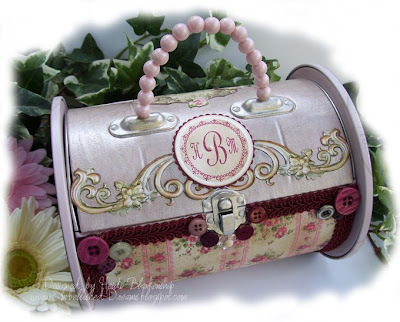 As many of you know I entered the Monogram Purse in the JustRite Stampin' Champion Contest and last night they announced that it was one of the "hopefuls" for the week--but wait it gets better--this morning when I went to check the JustRite Stampers Blog my Monogram Purse was listed as one of the Finalists!!! I would really, really apprciate your vote!!! You can find out all about the voting by clicking HERE. You can see all the finalists for the week and give your personal vote. You can vote today through Monday evening. Watch the poll timer for the exact end time but it will be around 9:00 Eastern time. Thank you so much!!! Ok now what you really want to know about--the Monogram Purse. I found the purse at walmart but I have also seen them at other discount and craft stores. Here are a couple of before pictures. After As you can see from the pictures I pretty much altered the entire purse. 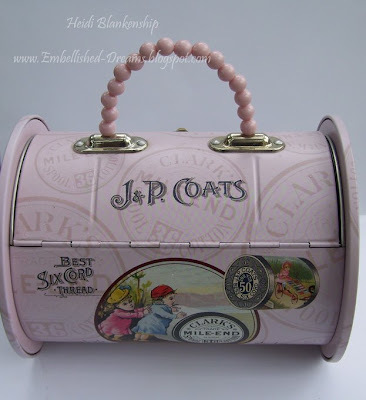 You can see more pictures of the Monogram Purse by clicking HERE. So many of you were asking exactly how I altered the purse so I have decided to do a tutorial for the Monogram Purse. Please check back in the earlier part of next week and I will post a step by step photo tutorial. I will also have a surprise for you so be sure to check back!! I think you're gonna LOVE IT!! Thanks so much for stopping by today & I hope you have a GREAT WEEKEND!!! 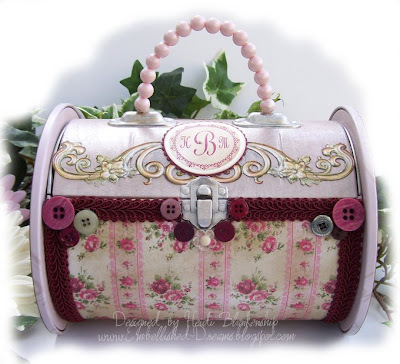 Don't forget to check out the JustRite Stampers Blog and vote for your favorite project!! Thank you so much for stopping by today & I hope I have given you another idea for using JustRite Stampers monogram stamps! 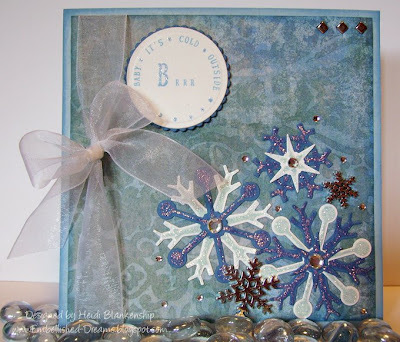 Be sure to check out all of the great ideas on the JustRite Stampers Blog! Hope you have a great Day!! Brrr Baby it's cold outside! I don't know about you but I think here in MN we went from summer to fall all in one day! It was 73 when I woke up this morning, the temp has been dropping all day and it is going to get down in the 40's tonight!! Crazy! Here is another card I made for the JustRite Stampin' Champion Contest. You can find out all of the details about the contest HERE. This is week three of the contest and if you have some JustRite stamps you still have time to join in the fun! I have been having a lot of fun trying to think up different ways to use the JustRite stamps! 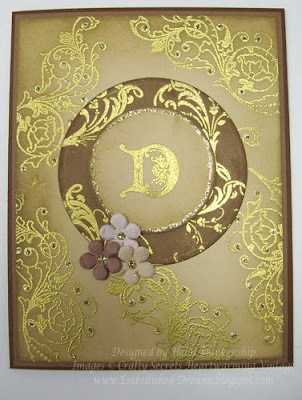 For this card I used the JustRite Stampers Small Letter Set & C-45 Monogram Medium Letter. The base of the card is Nautical Blue Light CS & I inked the edges with Azurite Chalk Ink by ClearSnap. The DP is from My Mind's Eye, Bohemia Collection and I also inked the edges with Azurite Ink. I stamped the sentiment using Azurite Ink onto Cryogen White CS. 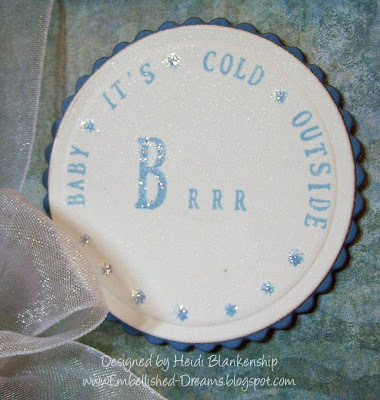 Then using the Wizard, Universal Die Cutting & Embossing System and the Classic & Petite Scallop Circle Nestabilities (S4-114, S4-115) from Spellbinders I cut out the sentiment and a blue scallop circle. 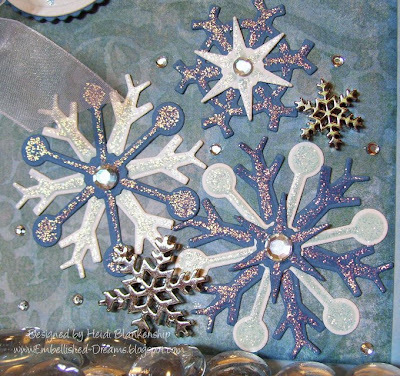 For the snowflakes I used Cryogen White CS and Nautical Blue Medium CS from Prism and the Snowflake Wonder die (S4-085). After I cut out all of the snowflakes I layered them and added Diamond Stickles from Ranger and a Rhinestone for the center. I also added a little stickles on the sentiment. I added a white sheer ribbon off to the side, brads, silver snowflake buttons (with the backs cut off) and a few more tiny rhinestones. Here is a close up of the snowflakes. I love all the sparkles!! 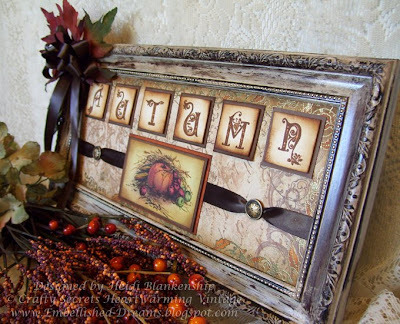 Thanks so much for stopping by today and don't forget to check out the JustRite Stampers Blog for tons of inspiration!! I love this time of year, warm days, cooler nights and there is a crispness in the air. I have a feeling we are going to have an early or a hard winter here in MN...the acorns started falling about a month ago! But I hope that we will have a beautiful Autumn to enjoy before the cold sets in. 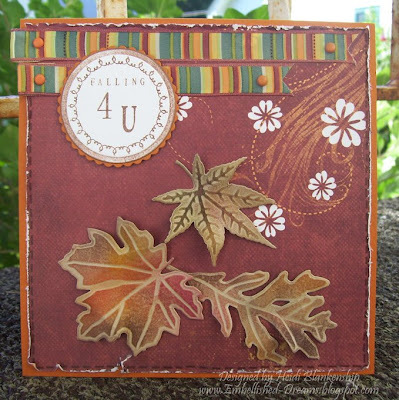 Being in the mood for Fall this is a card I made for the JustRite Stampin' Champion Contest. I was trying to think out of the box and come up with an idea that was different from a monogram. With the JustRite Stampers you can design your own stamps to say whatever you would like! Gotta LOVE that!! Just think how many times have you wanted a certain saying for a card that you didn't have? Now the problem can be solved!! 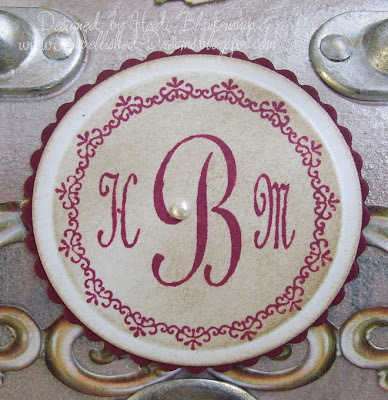 For the sentiment I used a border from Special Occasions, Small Letter Set & C-45 Monogram Medium Letters from JustRite Stampers. 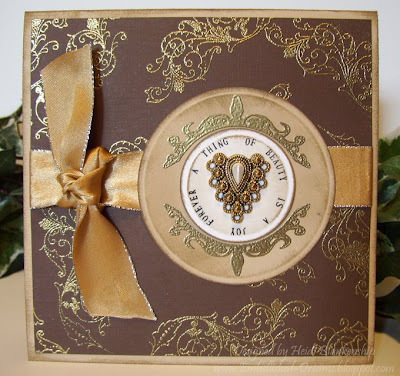 I stamped everything first using Chestnut Roan Chalk Ink from ClearSnap and then I went back and lined up the Nestability and used the Wizard, Universal Die Cutting & Embossing System from Spellbinders to cut out the Nestabilities. I also cut out a Petite Scallop Circle Nestabilitiy to use for a mat. The designer paper and the ribbon are from Fancy Pants True Collection. I distressed the edges of the paper and used a brown Identi Pen from Sakura to make the little stitch marks around the edge of the paper. 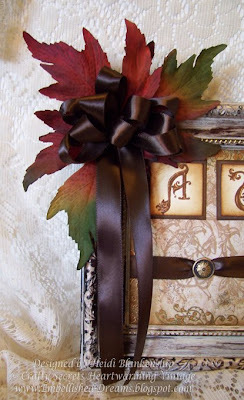 To make these beautiful die cut leaves I used the Assorted Leaves (S4-076) die from Spellbinders. Before I took the paper out of the die I used Creamy Brown Chalk Ink from ClearSnap to stencil the die cuts. After I popped them out then I used Pastels from The Stencil Collection to color in the leaves. Doing this really makes the embossing pop! I crumpled up the leaves just a bit to give them some dimension and then adhered them using ZipDry from Beacon. For the base of the card I used Prism cardstock. This was a fun Fall card to make & great to give to the Special someone in your life! 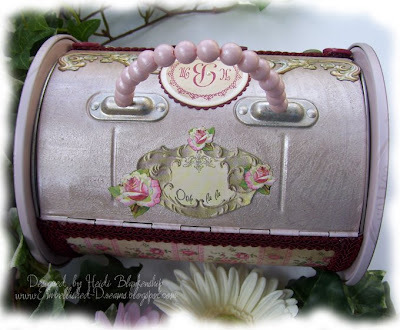 Don't forget to check out the JustRite Stampers Blog for tons for Fantastic Ideas!! Thanks so much for stopping by today! I hope you are enjoying your holiday weekend & have a Wonderful Labor Day! !